And he’s back. One of my favorite designers , Marcel Wanders, designed the latest addition to the Mondrian hotels, the Mondrian Doha in Qatar. sbe, the leading lifestyle hospitality company that develops, manages and operates award-winning hospitality venues globally, announced that they will open itsfirst hotel in the Middle East with the launch of Mondrian Doha, Qatar in spring (quarter two), 2017. The lavish 270-room hotel has been designed in collaboration with world-renowned Dutch designer, Marcel Wanders, along with South West Architecture – the architectural company of record for Mondrian Doha, responsible for the design of the building. Introducing the latest additions to Marcel Wanders’ luxurious ‘Jardind’Eden’ collection for Christofle. The new products include several exceptional pieces of Haute Orfèvrerie. 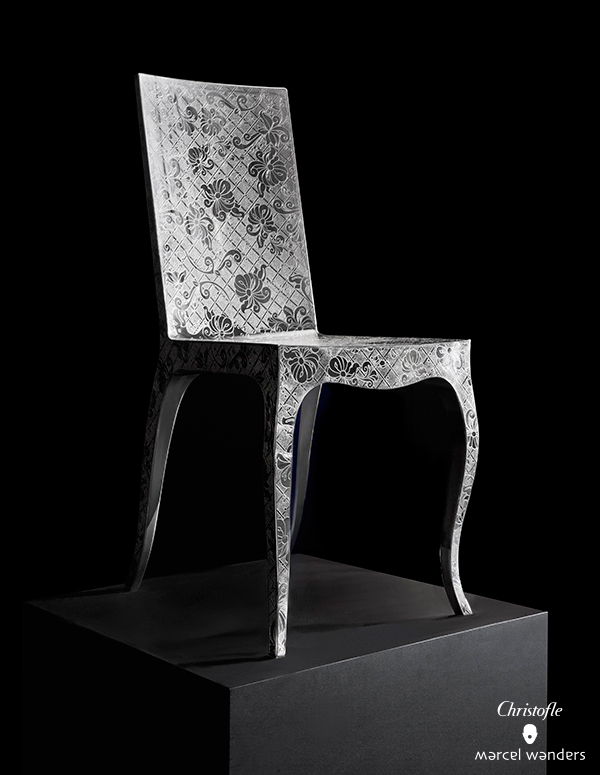 Among these are a dining chair and a clock with floral steel engravings, produced with the technical support of Luigi Barei. These products are gems of filigree extravagance, handcrafted know-how and endless beauty. An expression of Marcel Wanders’ invigorating festivity, the bowl and tray centerpieces carry the collection’s signature pattern of interlaced leaves, curled lys flowers and decorative apples against a geometric grid reminiscent of the lush garden. Jardin d’Eden is a whimsical, luxurious and sensual collection, whose stylistically distinctive pieces render the finest of what the worlds of design and silversmith’s craft has to offer. Available from October onwards through the Christofle website and at selected Christofle retail stores. 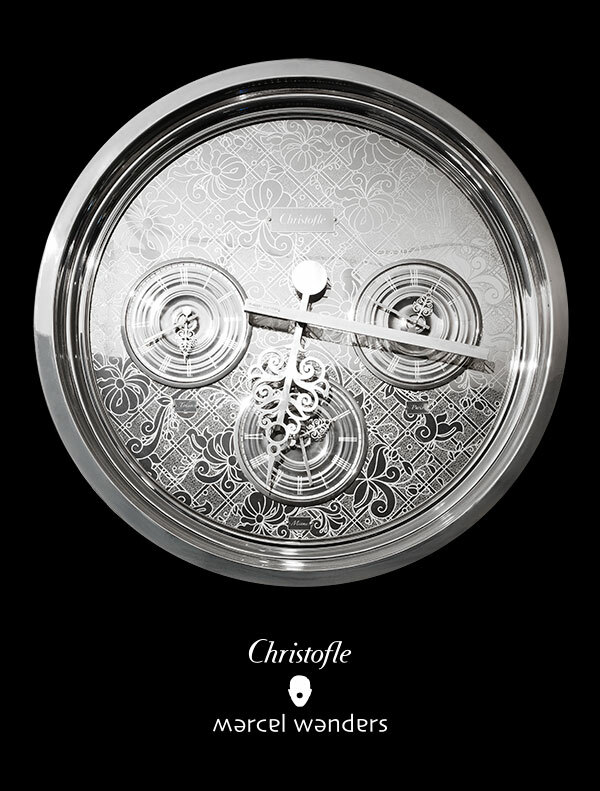 Marcel Wanders creates a state-of-the-art clock for Christofle. Joining meticulous design and fine mechanical skills, this item sets a new standard in the manufacture of luxury mechanical clocks. Oversized proportions, complex etching work and noble materials set the pace. Available in an exclusive edition of 50, the owner can customize the three internal clocks to time different cities across the globe; anywhere from Tokyo to Paris to Miami. Preciousness, sensuality and poetry distinguish the silversmith’s work. As part of the Jardin d’ Eden silverware collection, the nature-inspired silver etchings are lovingly executed. This clock carries the family’s iconic pattern signature; interlaced leaves, curled lys flowers and decorative apples against a geometric matrix reminiscent of the lush garden. Marcel’s sustainability strategy comes across in his high standard design; this is a timeless luxurious item to always hold on to. Departing from their well-known glass mosaics, luxury Italian design brand Bisazza has launched a new line of decorative ceramic wall tiles for their 2014 collection; a bold, brand new collection conceived and created by Marcel Wanders. The tiles use Marcel’s signature hexagonal shape, and come in black or white diamond and flower forms that can be freely matched, transforming walls into tactile and asymmetrical artworks. Innovative and daring, Frozen Garden is ideal for all interiors. Marcel Wanders has created a lovely image for the Quasar Istanbul interior design and has helped the resort which is due to operate in 2015, win several awards. Currently under development and due to open in the 1st quarter of 2015, the Quasar Residences articulate the dynamic fusion of east and west in a city at the cusp. Istanbul will be home to this vibrant, alive and at the same time grounded apartment complex, one that represents a new era in luxury living for this cosmopolitan metropolis. Quasar was recently announced European champion in 3 different categories at the European Property Awards. The project came first in both Turkey and in Europe in the fields of ‘Best Leisure Architecture,’ ‘Best Apartment’ and ‘Best Development Multiple Units.’ It was also awarded the first prize in Turkey in the fields of ‘Best High-Rise Architecture’ and ‘Best Leisure Development.’ The Project also won the Highly Commended awards for the ‘Mixed Use Architecture’ and ‘Residential High Rise Development’ categories, and picked up a further award from Dubai at the Cityscape Global Awards, for ‘Best Commercial & Mixed Use Project (Future)’ field.